It’s a bad day for Carla as she refuses to visit Aidan’s grave on his birthday, not wanting to bump into Kate. Peter doesn't give up on the idea and collars Johnny to ask him for a favour. Having convinced Carla her family has already visited, Peter guides her towards Aidan’s grave. Back at the Rovers the Connors raise a glass to Aidan, and Kate is outraged when Peter brings Carla to join them, angrily accusing her of killing Rana. As Kate storms into the back, Carla’s horrified when she receives a message online: “you destroy everything you touch”. Shakily handing her phone to Peter and Michelle, they are aghast to see the sender’s name is Rana! When Emma announces she’s holding a Mr & Mrs contest at the Rovers, Gemma persuades reluctant Chesney to enter. Chesney is shaken when he steps into the path of a milk float and, faced with the ramifications of his death, resolves to make a will. Gemma insists that she would take on Joseph. Despite Gemma’s offer, Chesney asks Tyrone if he and Fiz will look after Joseph in the event of his death. Gary takes charge of minding Harry for the day but when Mary calls on Gary to repair some damaged guttering at No.3 he forms a plan. Instructed by Nick, David gives Natalie a series of menial tasks in the barbers to encourage her to quit. After getting her to clean the toilet, David asks Natalie to count and test all of the shampoo bottles. Sussing what he’s up to, Natalie agrees without complaint. Sinead’s a bag of nerves ahead of her final treatment session. Daniel tries to reassure her but Sinead fears if it hasn’t worked she isn’t strong enough to go through it all over again. 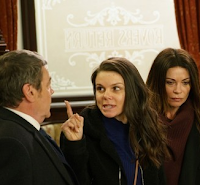 A row ensues when Peter accuses Kate of sending Carla the message from Rana’s account. As Kate and Imran vehemently deny it the two wonder who sent the message. Johnny confides in Michelle that he fears the message could push Carla over the edge. When Peter finds Carla sitting in Victoria Gardens and leads her home, Carla looks around nervously, certain she’s being watched. Back at No.1 Ken and Peter worry as Carla knocks back wine gazing listlessly into thin air. When Carla receives another message from ‘Rana’ she is completely freaked out. Attempting to make amends with Gemma, Chesney promises her he felt Fiz and Tyrone were best placed to take on Joseph and it’s not a matter of her being too irresponsible. Gemma is unconvinced as they head to The Rovers to take part in the Mr & Mrs competition. Tracey blames Steve when they are the first couple to be knocked out of the quiz and argues they are the only genuine Mr&Mrs taking part. When Chesney retorts that he and Gemma don’t need to be married to prove they are committed, Gemma is pleased. However things go quickly downhill when Chesney names ‘irresponsible’ as Gemma’s greatest fault and they lose the quiz. Gary enlists Faye to look after Harry while he does Mary’s guttering. When Sarah ticks off Gary for dumping Harry, Gary lies that Peter’s bribe money all went on paying his workers’ wages so he’s still got to graft wherever he can. Seeing he’s doing his best, Sarah hugs a guilty Gary. As Natalie’s about to head home for the day, Nick produces a fancy dress costume and sends her to hand out leaflets. Wise to his game, Natalie calmly goes. Back at the barbers she informs David she won’t quit as she really wants to learn the trade. What will David do next? Sinead gets emotional as she prepares to go into hospital overnight but Daniel assures her that he and Bertie will be waiting for her when she’s finished treatment. As a harassed Gary ignores Rick’s phone calls, he finishes Mary’s guttering but lies to her that further repairs are needed as a matter of urgency. Mary hires Gary leaving him riddled with guilt. When Rick drives Gary to an assisted living complex, he reveals that he expects Gary to con some gullible old biddies into taking out high-interest loans. Will a desperate Gary agree? Carla’s emotional as she leaves another voicemail for Rana, asking her to ring back. Peter apologises to Kate for blaming her for sending the messages and requests her help identifying the real culprit. Kate agrees, but only to discover who’s sullying Rana’s memory, and enlists the help of Alya to find out which of Rana’s friends may have had access to her account. Carla’s paranoia grows when she covers the webcam on her laptop, fearing she’s being spied on. After an argument, Toyah tries to restore peace between her and Imran but when he snaps at her she storms off. As a peace offering, Imran attempts to cook a veg curry. Nick looks forward to getting Underworld up and running in the community centre. Paul reminds Gemma of the fun-filled caravan trips of their youth and offers to make some enquiries. Ken and Daniel discuss readings for Bertie’s christening. When Daniel says he’s not interested in the religious aspect, Ken suggests a humanist ceremony. With Rick’s eyes boring into him, Gary reluctantly knocks on the door of a sweet old lady who, hearing he’s offering loans, ushers him inside. Gary is sickened as Rick spots Alex on the street and effortlessly interests him in a loan, requesting his passport and PIN in order to simplify the repayments. In The Rovers, Gary warns Alex to think twice about taking a loan from Rick but he proceeds with the loan nevertheless. When Rick guesses Gary tries to put him off he warns Sarah and Harry will suffer if he doesn’t start paying ball. As Sarah climbs into bed, Gary sobs quietly at the kitchen table. Seeing Peter’s bewilderment at her erratic behaviour, Carla panics that he’s been brainwashed. To make matters worse, Carla hears Rick’s whispered threats to Gary in the backyard of No.1, and her paranoia soars. Daniel looks on with pride as an emotional Sinead rings the bell signifying the end of her treatment. When Daniel suggests they hold a naming ceremony for Bertie Sinead loves the idea but predicts her family will expect a traditional christening. Toyah’s relieved to see Imran making progress, but when Imran collars Wayne for news of the accident report, it’s clear Rana’s death is still very much on his mind. Peter and Ken worry for Carla as she scribbles the words “watching” and “murder” on a crossword and throws her tea down the sink convinced she’s being poisoned. As her paranoia swirls out of control she leaves the house barefoot. When Peter goes to look for her he finds her staring at the remains of the factory and, realising she’s seriously ill, takes her to the medical centre. Carla thinks it’s a trap and as Toyah takes her through to the consulting room, explaining to Peter that Carla needs to see a mental health specialist, she panics. When the two return they are horrified to learn Carla has made her escape via the window. Having summoned the police, Peter reports Carla missing.